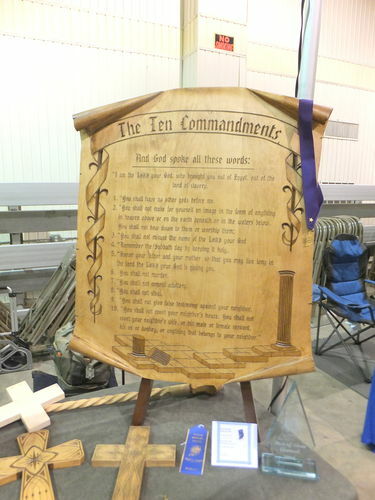 In March I decided that I would chip carve the 10 commandments in a wooden scroll for this years large carving. It’s been a long drawn out journey but I finally completed it just in time for the first woodcarving show. This is all 8/4 basswood glued together to make the 28” wide x 36” tall scroll. Carving the scroll and chip carving was the easy part for me. The design process is always the tough part for me. I also did something different for me and that was the stain highlighting of a few areas. Another top notch carving. You must have been thinking a lot about God’s Law as you worked on this project. I’d be glad to share this work with my members. If you’d like me to do this please email [email protected] with several pictures and I’ll include them in a future E-letter. Roger, that is very impressive work from the design to the carving! Does anyone sell “woodout” in case you make a mistake? I am positive that if I tried that I would definitely need some! Absolutely stunning! What a labor of love! Love of the words, love of the craft! Wow! I may have to try chip carving, if for no other reason than to really appreciate all the work, effort and love that went into this. Thanks for sharing, Roger. Roger. A beautiful job, I hope that you checked the spelling a couple of times before starting. Wow Roger, once again you demonstrate that you are a master at your craft. Your patience and skill and attention to detail are simply outstanding. I know you will do well in all shows that you enter. Once again you have raised the bar! Roger, this is absolutely beautiful. I love the way the grain shows in the background behind the letters. This is really outstanding . . . design and workmanship! Thanks for sharing. wow very impressive great job! great subject too! love this!!! An update. This past weekend I entered the piece in a woodcarving show and came away with Best of Show.